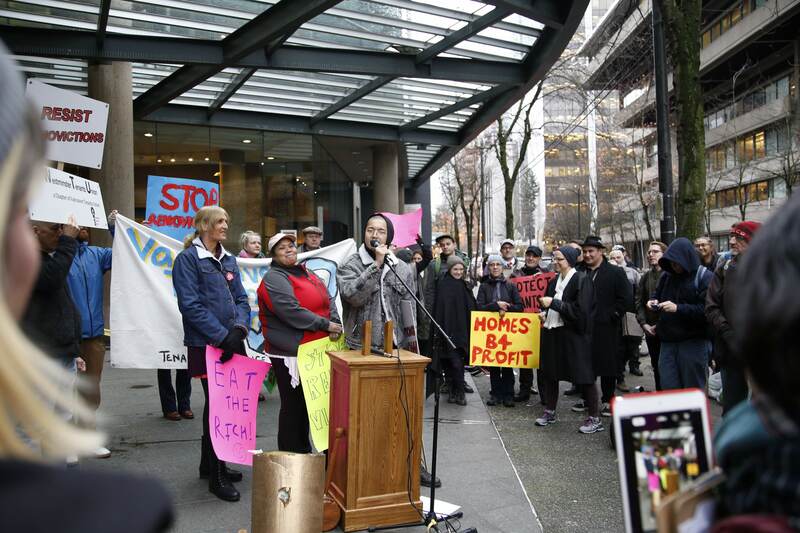 Now that tenants’ demands have reached Vancouver City Hall, corporate real estate interests will do their best to undermine our work and push their agenda. 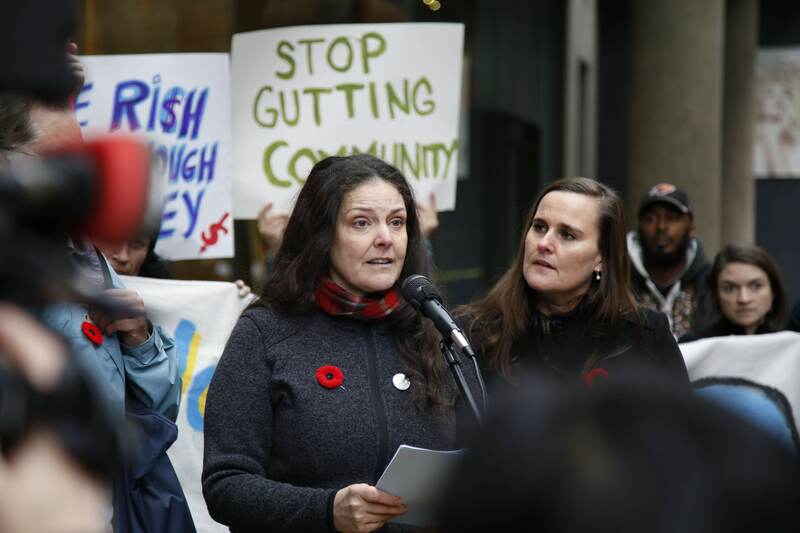 These past weeks the landlord lobby has been trying to sway city politicians against measures to strengthen the City’s Tenant Relocation and Protection Policy, as well as city efforts to push the provincial government to implement vacancy control. Vacancy control is a kind of rent control that prevents landlords from raising the rent in between tenants. We’ll have the opportunity to hear testimony before City Council from Vancouver residents who are affected by these policies at 6PM on Tuesday November 27th. 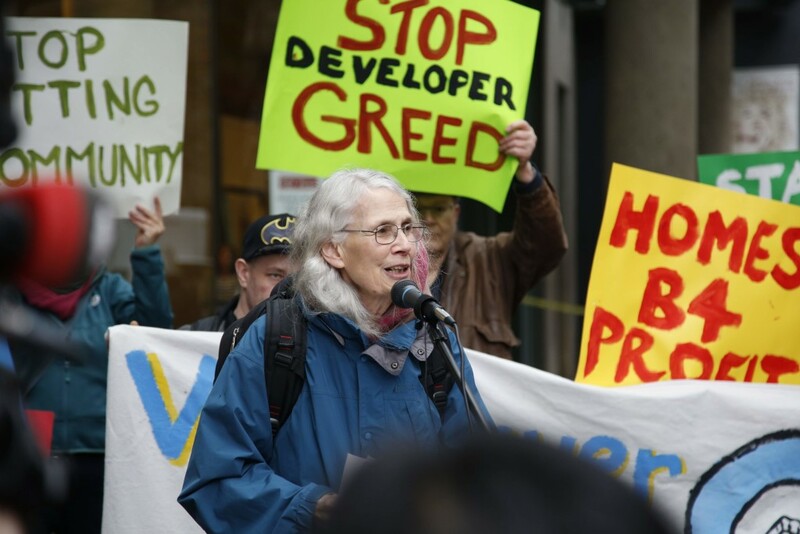 LandlordBC’s CEO David Hutniak sent a letter to City of Vancouver Mayor and Council in opposition to Councillor Swanson’s Motion B10 Protecting Tenants from Renovictions and Aggressive Buy-Outs. It is important to see what these attempts to discredit the motion for what they are: a plea for politicians to prioritize the immense profits of landlords over tenant security and to frame market development as the only credible solution to the current housing crisis. The beginning of the letter states that “Vacant possession is typically necessary due to the complexity of the renovation and due to health and safety concerns for the tenants” and conveniently does not mention that many tenants are willing to temporarily move to accommodate these kinds of renovations. Hutniak argues that a landlord has the right to “invest in their asset,” but we have to be clear that this asset, housing, is a human right. While we rely on the private market to supply this right it is only reasonable that the levels of government make policy to ensure that tenants aren’t abused by landlords during the housing crisis. Under the Residential Tenancy Regulation (Section 23.1), landlords have every opportunity to legally increase rent based on evidence that their costs have grown unexpectedly. The NDP recently expanded this power to cover maintenance costs when they reduced the allowable yearly increase to be tied to inflation. Why then is LandlordBC so unwilling to advocate for using the appropriate and legal channels to increase rent? It’s because Motion B10 does not target legitimate maintenance and expenses, it targets profit motivated evictions where landlords don’t need to be held accountable for their costs. Instead they can exploit a legal loophole, displacing people in order to charge exorbitant rents. This loophole was challenged in the BC Supreme Court in Baumann v. Aarti Investments Ltd. where it was decided that landlords don’t need to end tenancies if tenants voluntarily move out to accommodate renovations. It’s no surprise that when Aarti Investments Ltd. appealed the ruling, LandlordBC sought to intervene in the court case. We ask the City to uphold the Provincial Government’s Tenancy Policy Guidelines that state that a tenant’s lease should not be terminated if they are willing to accommodate renovations. Renovations should be a negotiation between landlords and tenants, not the cruel cash grab that they currently are, forcing tenants out of their homes and communities. Meanwhile, the VTU sees an overwhelming amount of instances where tenants struggle with landlords that ignore routine maintenance and let buildings crumble, too scared to complain because of the threat that they may get served an eviction notice. We do not agree that new purpose built rental cannot be profitable under vacancy control. Newly built market rentals may be initially rented out at whatever price the landlord wishes. This, coupled with the RTR’s robust protections for maintenance costs makes Hutniak’s argument hard to believe. Landlords will still be able to profit, they will just not be able to enjoy the unhinged gains that the current housing market has afforded them. Vacancy control is not a new or a radical policy and it is currently enjoyed by Manitoba, Quebec and PEI. For a short time in the 1970s BC implemented vacancy control with wide public support. Developers successfully lobbied the provincial government to remove the policy in 1984, promising more private rental stock. Instead they built condos and jacked up rents in existing stock. The private market has always let us down when it comes to building affordable rental stock. We saw the most relief not from lax rental regulations, but from federal spending and incentive programs through the 1950s until the 1980s. Right now, the City has a chance to stop the aggressive destruction of affordable housing stock by closing this loophole to align with provincial policy and by advocating for vacancy control. No amount of new non-market rentals can keep up with the current flipping of affordable housing stock into luxury apartments. We often find that when older buildings go up for sale, the ability to renovict tenants is often highlighted as a selling point. The City should not sabotage what work is being done to build new affordable housing and take action against renovictions and demovictions. People who lose their homes in this way often have nowhere to go, and as we watch the homeless population grow in Vancouver, we need to know that our City Government understands what is at stake. Vacancy Control and measures to stop renovictions will improve long term security and affordability. These measures are about making sure that all government aid goes directly into the pockets of people who need it most, and that the residents of this City don’t find every extra dollar they receive going directly to landlords. Motion B10, Protecting Tenants from Renovictions and Aggressive Buy-Outs, is about making sure that tenants feel secure in their homes and safe in their communities because they have the right to remain. Posted in City Hall, Housing, Opinion and tagged City Hall, housing, Vancouver Tenants Union. Bookmark the permalink. There’s good tenants and then there are the nightmares.